A sticking plaster made using stem cells harvested from a patient’s own thigh could be the key to beating heart failure. Researchers have mended damaged hearts using a tiny patch packed with the health-boosting cells. They glued the patch to the surface of the heart where it shored up damaged areas, helping the existing heart tissue to perform better and so improving the patient’s health. Hailing the breakthrough as ‘exciting’, Professor Metin Avkiran, associate medical director at the British Heart Foundation, said: ‘Heart failure is a cruel and debilitating illness affecting more than half a million people across the UK. Heart failure, which occurs when the organ becomes too weak to pump blood efficiently round the body, affects around 900,000 people in the UK and is the biggest drain on NHS resources of any disease after strokes. It leaves many sufferers struggling for breath and exhausted trying to do simple, everyday tasks such as dressing, eating and even getting out of bed. 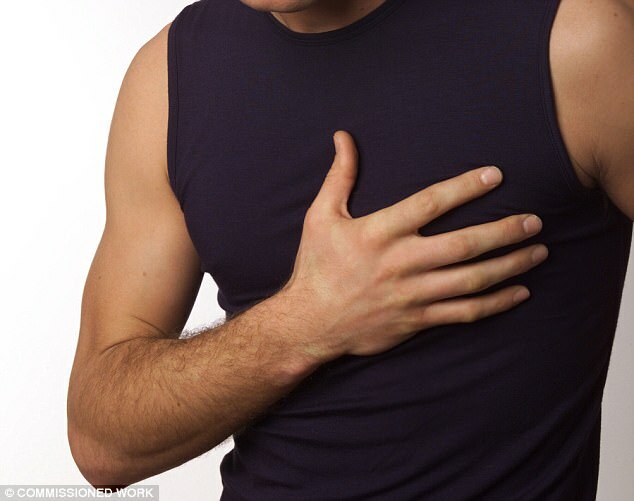 Heart failure is caused either by illnesses such as heart disease, diabetes and high blood pressure, or can be triggered by an unhealthy lifestyle including smoking, eating a high-fat diet, not exercising and being obese. Treatments include drugs and transplants but with up to 40 per cent of those affected dying within a year of diagnosis, heart failure has a worse survival rate than many cancers. The Japanese study, published in the Journal of the American Heart Association, investigated the use of muscle stem cells to repair damaged hearts. Having proved the technique could work in rats, the team from Osaka University chose 27 patients with heart failure who were limited in what exercise they could do and were not responding to other treatments. 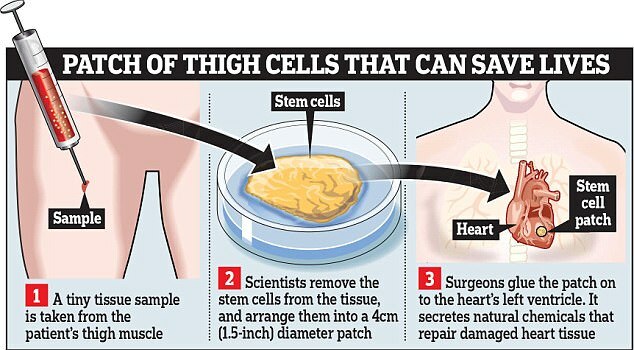 The trial involved making patches of stem cells from the patients’ own thigh muscles – the vastus medialis which is one of four making up the quadriceps muscle. The round patches – measuring about one and a half inches across – were then surgically glued into place on the surface of the left ventricle. Stem cells – ‘blank’ cells capable of acting as a repair kit for the body by replacing damaged tissue – encourage the regeneration of blood cells and blood vessels. Once in place, the implanted tissue cells secreted natural chemicals that encouraged the old tissue to behave differently, helping it to work better. After the operation, the patients suffered no significant complications. More importantly, a year after receiving the patch patients showed improvements in their capacity for exercise and the functioning of their hearts. The authors said that while therapies exist to treat heart failure, they are not good long-term options, and regenerating the damaged heart using a patient’s cells is a promising alternative. They said the study suggests this cell patch could be a viable therapy to treat heart failure but that larger clinical trials are needed to validate the findings.